The first three sites are located in the Highlands of Scotland on Forestry Commission land. The two sites which this Share Offer will support are: Allt Dearg and Allt Laghain (Laggan). 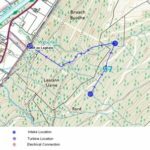 Taking on the next four Sites will depend on whether they receive all their permits and can be constructed by their Feed in Tariff deadlines. The scheme utilises a main intake on the Allt an Laghain burn at approximately 287m. The secondary intake is a similar design incorporating a half height Coanda screen. The turbine is a twin jet ‘Pelton’ type using Gilkes ‘Streamline’ design with mechanical spear actuators and a synchronous generator. The Turbine will be supplied by Gilbert Gilkes and Gordon Ltd along with a Marelli generator. The superstructure of the power house is block work construction with larch cladding. 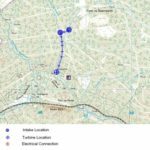 Grid Connection: The project has a grid connection agreement with Scottish and Southern Energy Power Distribution (SSEPD). The offer was originally accepted in July 2015 and subsequently a variation agreement was signed in January 2017. Average Annual Energy Yield: 1,429 MWh (When a complete year of monitoring is available HECo will apply for a variation to the CAR license which should allow a reduction in both the hands off flow, and residual flows, implying an increase in water availability for the Hydro Turbine. Under a varied CAR licence the Site should be capable of delivering 1,640 MWh). The lower yield figures have been used in the financial modelling of the Project. The site is located to the west of Invermoriston in Glen Moriston. The proposed penstock route connects two intakes close to an existing access track and then takes a route to the east side of the site, avoiding identified archaeological remains. The scheme utilises two intakes on Allt a Chaitchinn and Allt a Choire Buidhe both of which are at approximately 220m. The scheme will utilise an HDPE (High Density Polyethylene) penstock throughout the length. T, the type of penstock material proposed is suitable for low pressure hydro schemes such as this one. The project will use a triple jet Turgo turbine with an asynchronous generator. 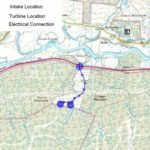 The turbine will be supplied by Hydrover Ltd who have considerable experience in the design and manufacture of smaller, low cost hydro turbines. HECO are to be contracted to construct the Site. Since incorporation in 2009 HECO has successfully secured consents for over 2 MW of micro-hydro capacity. They have worked with, or are continuing to work with, a number of community groups and are members of the British Hydropower Association and Scottish Renewables. The company has confirmed that it has sufficient capacity to deliver the Project. The Hydro Turbines will benefit from the usual manufacturer’s warranty. As the Hydro Turbines age, mechanical parts may need replacing, but modern Hydro Turbines are normally extremely reliable. After Commissioning of the Hydro Plant, HECO will manage the ongoing operation and maintenance aspects of the Sites for the SPVs under a standard NEC contract.